Attention: Nous avons besoin de plus de monde pour travailler sur le code source si nous voulons être capable d'honorer toutes les demandes..
"Bon, cela pourrait servir a quelqu'un." "Je ferais probablement usage de cette fonction." "Ce n'est pas essentiel, mais j'aimerais beaucoup avoir cela a ma disposition." "Synfig serait tellement mieux avec ce changement." "Je ne peux/veux pas utiliser Synfig sans cette fonction!" As described in Sewing BLines, when linking red tangent to yellow they are placed opposite against each other. This is normal from the program's point of view, but not normal for new users. Even more, to avoid this effect user needs to made some complex steps (see Sewing BLines). It takes a lot of time if we vahe lot of verticles to sew their tangents. When linking tangents with the same color, program should act as usual. When linking tangents with different color program should automaticaly add Convert->Scale (-1) to avoid their opposite placement. When linking tangents with the different color, program should act as it acts now - no additional converts added. When linking tangents with the same color program should automaticaly add Convert->Scale (-1) to plcae them opposite against each other. Synfigstudio should get a button in the render dialog, which calculates the total render time for the actual settings (frames per second, length of the film, resolution, output format) It should testrender 1 picture, when the amount of total frames is below 1000. Over 1000 frames, it should testrender 10 pictures for more precise calculation. I have made 25,000 small png-pictures with my 800Mhz computer in about 45 minutes. Synfigstudio did calculate each single frame of it. Nothing changed in this picture, so it does only need to get written to disk for the amount of pictures, until the next change (animation) has an effect on the output picture. This should save time for bigger projects with thousands of pictures. With smartrendering it is also possible to predict the total amound of space in Megabytes (Mibibytes) of the final render of the movie. It should calculate how much it needs and see, if enough space is free on the harddisk before the rendering get started. (2) It'd be nice if a newbie could quickly navigate around the source code. The best thing to do would be to add top-level comments in each file, explaining what that file does, a README.TXT in each directory, explaining what's in that directory. This would be pretty fast and easy to do, and make it much easier for new programmers to join. Time permitting, it would also be good to document on a high level what the data structures are, but that's harder, since those tend to evolve, and it is often difficult to keep in sync. It would also be useful to document what individual functions do (just a one-liner high-level description), but that also takes more time. (2/4) If you want to make a waving flag, it would be handful a sine function, tuned with random correctors, for example. -This should generate waypoints each 1, 2, 4 frames or any other step at artist's wish. -When applying a function you can add it to current values, add it to 1st frame values or simply override old values. Perhaps other options (such multiplication) would be fine, too. Something like texture editor in Art of Illusion, perhaps. The Amount parameter works exponentially; each time you add 1 to the Amount, the image is zoomed by a further factor of e (= 2.71828 or so). Would a duck be any use if it just controlled the value of Amount in a linear way? Workarounds include: export Amount, select it in the children dialog. Whatever's selected in the children dialog shows a duck. You can adjust it using that duck. (0) it would be nice to use libcontrast     to automatically adjust selected or all the palette items for best visual contrast. It would also be interesting to have a layer that uses this code to filter the image. — The ability for the user to create any number of custom channels for various purposes. — It would be great if autorecover could also recover the associated history of a file in the event of a crash. (3) — Like the traditional bitmap fill, but this fills the area clicked out to the nearest boundary paths with a region of that area, set to the foreground color (it actually would create a new region layer). If this is implemented, it will probably be necessary to change the existing "fill" tool's name and icon to a "color injector" (hypodermic needle / turkey injector icon) tool, as that's closer to describing what it does. 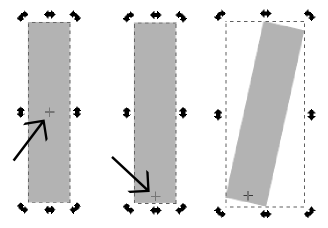 (4-5) — Intutive reshaping of path-based layers. See link. — This should solve all complaints about the layout, without requiring Synfig to be "just like program (x)". See UI Reloaded for progress on this. (3) — This tool does what a lot of folks are looking for, warping selected ducks in a "soft" fashion. But it's not very obvious what sort of effect it will have, from the tool's interface. It needs some sort of momentary center-of-action and radius indicator at the very least. 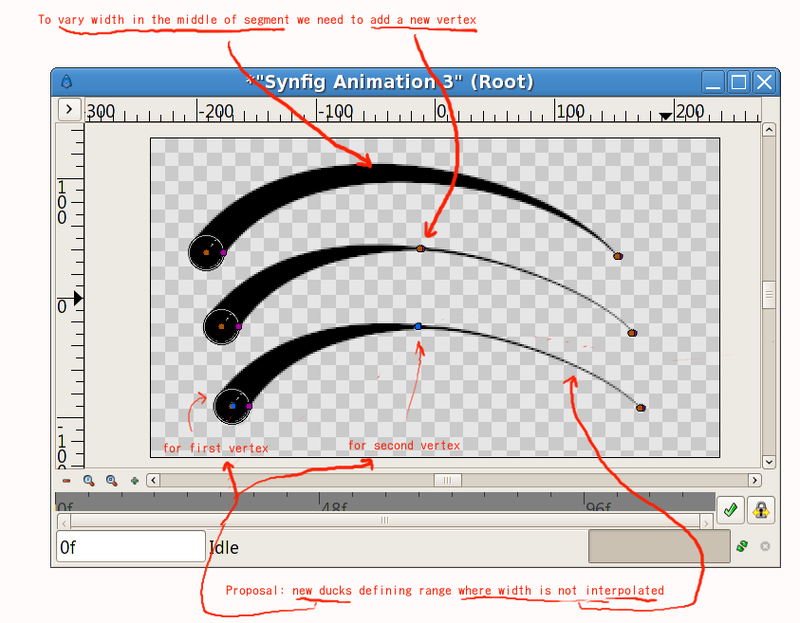 Perhaps an "influence gradient" overlaid on the canvas once Synfig's core is sped up? (2) — Like Inkscape's "inkboard" feature (using Jabber), or Blender's Verse server , or OpenCanvas's Networking option. This should probably farm off all the networking stuff to the telepathy framework so that synfig doesn't have to deal with all the account/etc issues. (3) — (BBQ Pulled Duck) Inkscape has this for still handles - basically, grab a section of the spline between handles, and pull it around, the program automatically alters the tangent handles to match. What would be really neat is if you could do the same for temporal handles - be able to grab the spline between keyframes, and yank it around, and have Synfig automatically adjust the key interpolation to match. Not sure exactly what the workflow in the UI would be for this, however. -Agreed; blender does this with its IPO curves, and it's a really efficient way to work. (1) of some sort will no doubt be demanded by the userbase eventually, for studio-specific automation of tasks, noncompiled plugins, etc. I (SnapSilverlight) don't have any particular use for it at the moment, tho'. (1) — For Apache. Render .sif to some format like png/mng on access. (1) — Let Mozilla and Mozilla-based view synfig files in-browser. I want to use the as a character generator for a TV show. By using chroma key hide the background. Even better interface to a video overlay card with Alpha blending. (3/4) - (zotz) Menu item, functionality that would collect alll files referenced in a sif and place them all in a tgz for sending elsewhere or publishing anumations in source form. (3/4) - (zotz) Haven't thought this all through yet, but synfig could come with a library of categotrised "objects" with a copyleft license (GPL? CC BY-SA?) An animation clip art type deal. Depending on individual desktop setups, single window is sometimes preferable to many windows. Can we have a single-window option? Also, even with many windows, Windows-users especially might find it better if all the windows only appeared as a single one on the taskbar. (3-2) And allow maintain the organization once the file is saved. At the moment they are reordered in alphabetical order which is useless and annoying. It would be cool if synfigstudio had support for XICC. Ok There is four things. Upper left is Lumascope (Luma Waveform in blender). X-Axis represents image's X-Axys. Y-Axis is average luminescence of column of pixels. Upper right is Chromascope (Chroma Vectorscope in blender). Just look description on blender wiki. Lower right is histograms. X is luminescence and Y is count of pixels with such luminiscence. As reported in Bug #1888858 waypoints are not displayed for canvas switch events. I suggest to rearrange waypoints display according to this scheme. Is it possible to add "weigths" for widths? ^_^ I.e. width changes not all the way along the segment. Maybe something like a duck on bline which indicates the region where the width of current vertex isn't changed. Illustration here. How easy is it to stick in a colour square/wheel? Messing with sliders is somewhat obstructive. A button to create a waypoint for every selected duck, in its current position. Moving each duck up a bit and down again quickly gets tedious. Holding shift while moving tangeant ducks should automatically split them. They can be rejoined if necessary through the context menu as they are now. This page was last modified on 22 February 2010, at 02:15.